He never met a stranger. 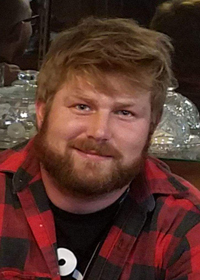 Payden Donald Schoonover, 27, passed away Friday, November 30, 2018. He was born October 19, 1991 in Des Moines, Iowa to Dennis Schoonover, Jr. and Melissa Nalevanko. He graduated from Saydel High School in 2010 and went on to work in the construction field. Payden was a people person and he loved his friends like family. He was a charmer who had an infectious smile and contagious energy. He never met a stranger. Family meant everything to Payden and he would never hesitate to help out anyone in need. The grass never grew under Payden’s feet; he was always on the go. Payden liked to make a good impression. He was always the best dressed and had the biggest blue eyes. He will be greatly missed by all who knew him. He is survived by his parents, Melissa Nalevanko and Dennis Schoonover, Jr.; siblings, Jenna (Christian Signorelli) Schoonover, Chastity (Billy) Rizzo, and Tim (Tabitha) Crowder; aunts and uncles, Jon & Traci Nalevanko, Mikki & Tom Griffin, and Denise & Donnie Christiansen; grandmother, Maureen Nalevanko; and many close cousins, extended family and friends. Payden was preceded in death by his grandparents, Ester Sodergren and Francis Nalevanko. There will be a celebration of life at 5:00 p.m. Thursday, December 6, 2018 at Hamilton’s Funeral Home, 605 Lyon Street, Des Moines. Visitation will be from 3:00 to 5:00 p.m. Contributions may be directed to the family in loving memory of Payden. Funds will be collected for a charitable donation to a cause close to Payden’s heart, to be determined.